Safed Candles is such a central site for visitors to Tzfat that it's hard to realize that its history goes back only 18 years. But in fact, that's the period that the Safed Candles has been situated in the Old City, drawing visitors who marvel at the beautiful candles and beeswax sculptures that are on display there. Safed Candles was begun almost two decades ago by a Tzfat resident, a member of the Breslav Hassidic sect, who was looking to start a small business that would provide employment for some local residents. He set up his shop in a small cubby-hole on the edge of the Old City, next to the Ari Ashkenazi synagogue. There, a small staff of men and women hand-dipped and wove candles from beeswax into candles to be used for Jewish ceremonial purposes - for welcoming the Sabbath, for the Sabbath-close ceremony, Hannukah candles and others. The little shop began to grow when tour guides found out about it, and through the years, it expanded, adding paraffin candles to its inventory which were brightly colored and decorated. With the arrival of Moshe Chaim Gress, an artist who saw the possibilities of sculpting beeswax, the little shop became flooded with tourists who enjoyed his creative sculptures depicting biblical scenes, Jewish caricatures, religious ceremonies and many more. When the manufacture of the candles became too much for the small shop, the candle-making operation moved to an old warehouse outside of the Old City, but the shop, where the sculptures are made and new designs are created, remained in place. Smiley Hassidic faces, carved Jewish stars, good luck Hamsas - outlines of a hand with a prayer inscribed, and many other images combine to show that Judaica can be created from anything.....even wax. During the summer of 2008, the Candle Factory was renovated, and new rooms were discovered underneath the existing store - rooms which had been covered over through successive earthquakes in Tzfat, and remained under the ground. This discovery came fortuitously, as in October 2008, a massive fire destroyed the candle shop, burning the structure and the entire inventory within a few hours. Within a few weeks, the staff had regrouped and reopened the shop in the small rooms which had previously been unknown, and the shop has restocked, and is open for business while the larger structure is rebuilt. The owners of Safed Candles emphasize utilizing environmentally-friendly materials in the manufacture of their candles, and are justifiably proud of their product. 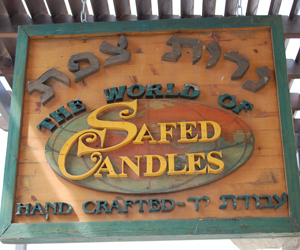 Safed Candles can be seen in their shop, next to the ARI Ashkanazi synagogue, in Tzfat's Old City. They can be contacted at 04-682-2068.